Some days. Like today. Up before the alarm, rain sluicing down the west windows, a chilly morning in the Pacific Northwest. Spring. I go into the kitchen and start making my coffee. Everyday I make the same choice; that is, I decide whether or not to use the drip filter, the French press or the stove top espresso thing. Most mornings I go with the filter. Lately I have been grinding a pound of the strong stuff – Dark French – when I buy it at the market, so as not make an ungodly amount of noise when I start the coffee process at home. Did I mention that I get up most mornings at three thirty or earlier? Once the coffee is measured into the filter, after a ritual of opening cupboard doors in order, taking down the paper filters, the requisite flick of the wrist to open the filter and the out-loud counting of double tablespoons, I turn to the sink, grab the ugly plastic cup that holds exactly the right amount of water, fill it, turn back to the machine, fill the tank and close the top. I hit the switch and turn to the freezer top of my refrigerator in order to get a couple of slices of “good” bread. Once I have my hands on the bread slices, I put them in the toaster on the island across from the coffee machine, put the dial up to eight and turn back to the refrigerator. I take out the half and half. These days this comes from a local dairy operation which claims — but for the USDA Organic rules — their old-fashioned dairy farm would be certifiably organic. Whatever. They are local and cheaper, and seem to be pretty tasty and easily available. I put the half and half on the counter top near the toaster, turn back to the refrigerator and grab the butter, carefully jammed into a ramekin for the memories of France and a long ago romance it suggests. With my other hand, I grab some jam made by a local farmer. 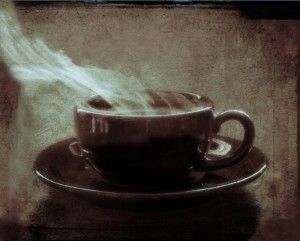 The toast pops, the coffee bubbles through, the kitchen smells of bread and coffee – pungent, reminiscent, inviting, earned. I put half and half into the hand-painted coffee cup that has followed me from that long ago romance and pour the dark roast home. I butter the toast lightly and spread a little jam on it, carefully, like each time is the first time. I slice the toast in halves and put it on another relic of France gone by. Most mornings I sit at the table in the kitchen and look out the window to the west. This morning it is streaked with rain; the mist in the valley plays ghostly with the cedar and the spruce. The valley lights are circled and diffuse, the mill far off bellows smoke into the wet night sky like a dragon in search of a knight of the realm. It is peaceful here, in the dark. Quiet. It is morning, my time of day. Today I remember that a few years ago I had just moved into a small place, a coach house with one big wood-paneled room and a kitchen and bathroom on the other side of the center wall. It too was a quiet place, off the road, set back among the Post Oaks and the Elms. I had just come through a long and heart-rending process wherein I gave up pretty nearly everything I had ever done, left everyone I knew, moved out of town, out of state, out of the country, to take a run a new start. I was worn out, broke, jobless and clean. I found myself just up the road from a store with an enormous pig on its sign. 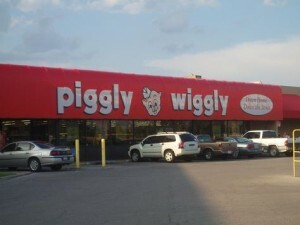 A chain supermarket that I had thought only existed in Eudora Welty or Barbara Kingsolver novels, yet there it was. I went down there after I unpacked my one suitcase and began to take stock, and stock up for the road ahead. Coffee was the first priority, but then I remembered that I did not have my assortment of pretentious high-priced coffee apparatuses. So what to do? I discovered, hiding in the back of the cupboard over the sink, a Mr. Coffee machine. The kind I used to howl at, as if anyone would ever use THAT to make coffee. But that’s what it had come to – so me and my new best friend, Mr. Coffee, began to get acquainted. The machine didn’t change the fact that being new in a town with no coffee shops – not a Starbucks for 40 miles, and no good coffee immediately available – meant I was going to have reinvent my morning routine. I found some Fog Buster from San Francisco for six bucks a pound, ground. I went looking for “good” bread, artistic loaves, and found Franz white bread and a stray Orowheat whole wheat. The half and half came straight from the industrial complex outside of town. There was a jar of jam and a plastic container of whipped Land O’ Lakes butter in the fridge, a gift from the former tenant. The next morning, after a ghastly, nightmare-filled sleepless night, I went into the kitchen, plugged in Mr. Coffee, pulled out the Fogbuster, eyeballed the measurement, filled the tank, put the toast in the toaster and waited. Eventually all things came to pass: the coffee brewed, the toast toasted, the whipped butter thing spread, the jam layered, the knife cut the halves and an awfully ugly but very serviceable plate carried the “first breakfast” to the table, which was in fact the very desk at which I sit right now. A spring rain came hard out of the North, pounding rhythm on the red tiles. Familiar and warm, it was also forlorn, the sound of something breaking apart, or maybe it was a sound of something healing. Time would tell. The paned windows were streaked, the Post Oaks lovely, quiet in the rain. I could smell the coffee and the toast in the morning air. The room empty of nearly any familiar thing took on a different tone. It wasn’t six-dollar-a-loaf Sourdough made by an ancient recipe; it wasn’t Dark French roasted Arabica from Colombia or Sumatra; it wasn’t organic sweet butter from the cows just over the hill. What it was though, was my breakfast, the first in the new house, in the new land if you will, on the first day of the rest of my life – or so it seemed. There was nothing familiar out there waiting for me. It would be a long day of finding meetings and learning the street names. It would be filled with false starts and wrong turns, some low-level swearing and a moment of recognition in the eyes of a stranger. It would be the beginning. If I did the footwork, stayed true to the possibility that I could survive the worst I had done to myself, then I would have another cup of coffee tomorrow morning, butter the whole wheat lightly, put a layer of jam on it and get on with it. It wasn’t much; in fact, it was nothing at all. A cup of cheap coffee, a couple of pieces of toast and jam, an early morning promise in a cracked cup. But it was mine and it felt like a true thing. This morning the taste of it, the feeling of it comes back to me. The coffee is much better; the bread too. The view is longer and trees outside are large and evergreen. The mountains to the west are boundary to ocean and endless tide. Some days, despite the changes in my circumstances, the upward curve, the second chance, I am reminded of that coffee, of the smell of the morning rain down on the Elm Fork of the Trinity, of the sun rising over bayous to the south, of the early days, of my first days. Some days that’s as good as it gets. Some days, like today, after the coffee is gone, and toast eaten, the dishes washed and stacked, there is nothing to do but hang on, to keep it tight, to seek out the words from wherever they may be hiding, to look far off south and keep the tears at bay, to wait for nightfall with its ghostly promise that tomorrow will be a better day. “Textured Coffee Cup” Scholastica Ees @ Flickr.com. Creative Commons. Some Rights Reserved.